A simple salad made almost entirely on the grill! 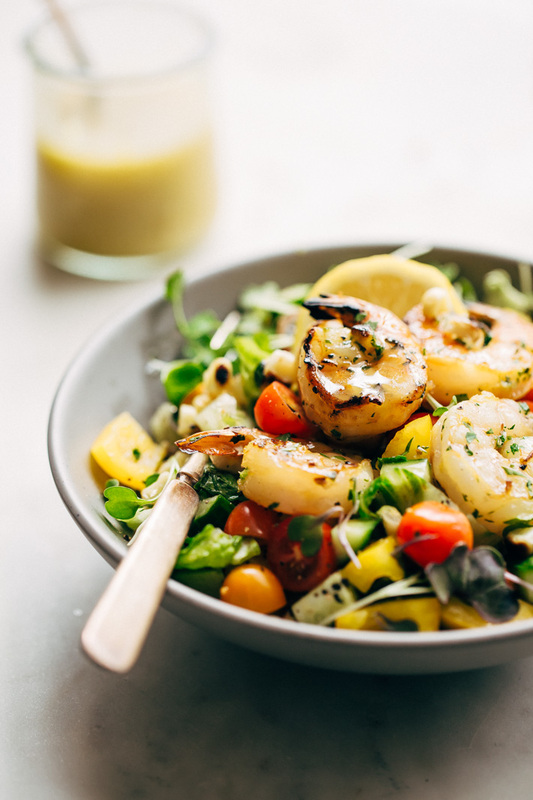 We’re grilling up romaine lettuce, shrimp, corn and bell peppers, and using it in this fresh grilled shrimp salad. Top it all off with my 4 ingredient honey mustard vinaigrette! Gimme all the fresh, clean eats. 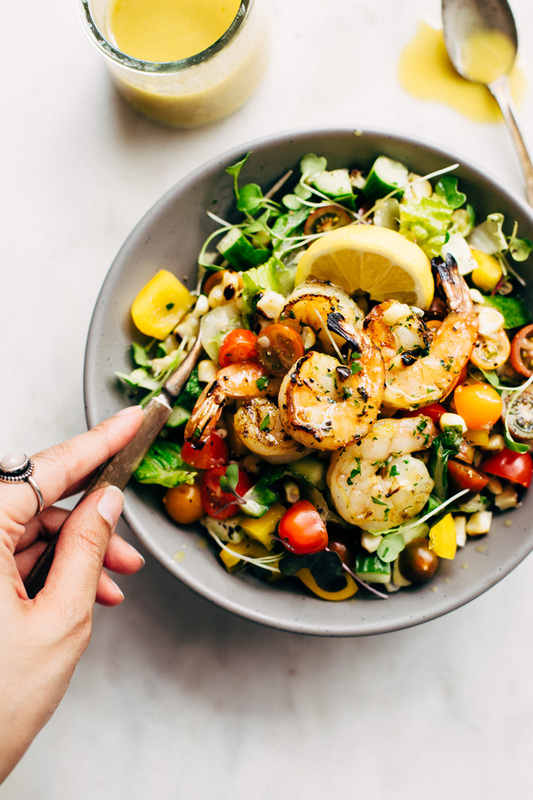 No joke, this grilled shrimp salad has been on repeat here at the LSJ headquarters every week for 3 weeks now. We simply cannot get enough. It’s got color! Crunch! Flavor! And 90% of the meal is prepared outside. Perfect because the temps in Houston are already touching 90 so please don’t make me turn on the stove. Yes, that’s 90ºF at the end of MARCH. What is even going to happen this summer? I don’t even want to know. But what makes this insane weather a little more bearable is loading up a tray full of grillable ingredients and sending hubby dear out to make the meal while you sit back and just take in the weekend vibes. Lets talk about this Grilled Shrimp Salad situation: we start with a bed of romaine lettuce, followed by grilled peppers, corn, and shrimp. Then we brighten this salad up with chopped grape tomatoes, a diced avocado, and cucumbers. But what’s important to remember here is it’s a salad made almost entirely on the grill. Freshy freshness to the maxz. Just look at that big, beautiful shrimp right there. ❤️ The marinade leaves the shrimp perfectly tender and those crispy grilled edges MAKE this salad. This marinade is easy, easy and can be used on a variety of other meats/poultry/seafood. It’s just a little olive oil, chopped parsley, a couple cloves of freshly chopped garlic, and the zest of one lemon with a little salt and pepper. I know, it doesn’t seem like a lot. But that flavah. The natural sweetness of the shrimp pairs beautifully with this simple marinade. Then just skewer the shrimp and pop them on the grill. I know that not everyone is as crazy about shrimp or seafood in general as we might be, so friends we’ve tested this recipe with chicken too and it works out fabulously. See the kinds of things i’m willing to do to make sure you have a GREAT salad experience? I kid. In all honesty, you’re the one that did me a favor. So thank you! Serious question: have you ever grilled romaine lettuce before? I’ve got to be honest, before making this grilled shrimp salad recipe, I turned my nose up at the thought of wilty lettuce. Why would someone purposefully grill (thus wilt) it? But i’ve been missing out. I’m eating my words and grilled romaine too. 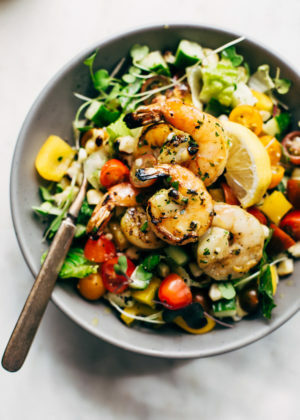 It’s smoky, it’s crunchy, and it’s perfect for this grilled shrimp salad. And I know, i’m the first one to whine about a leafy greens based salad and how it always leaves you unsatisfied but this shrimp salad has a lot going on! The corn, the tomatoes, the cucumbers, the shrimp, the gangs all here! Next we grill up corn and bell peppers. I used a yellow pepper this time but the recipe works well with red or orange peppers too. And grilling the peppers is optional! I pop it on the grill for about a minute – no where near enough time to get the grill marks but just to heat it through. But you do you! If you’re into the roasted bell pepper scene, leave it on the grill longer. Next time, I want to try swapping the pepper for a grilled poblano. My tex-mex loving heart urges me to do so. 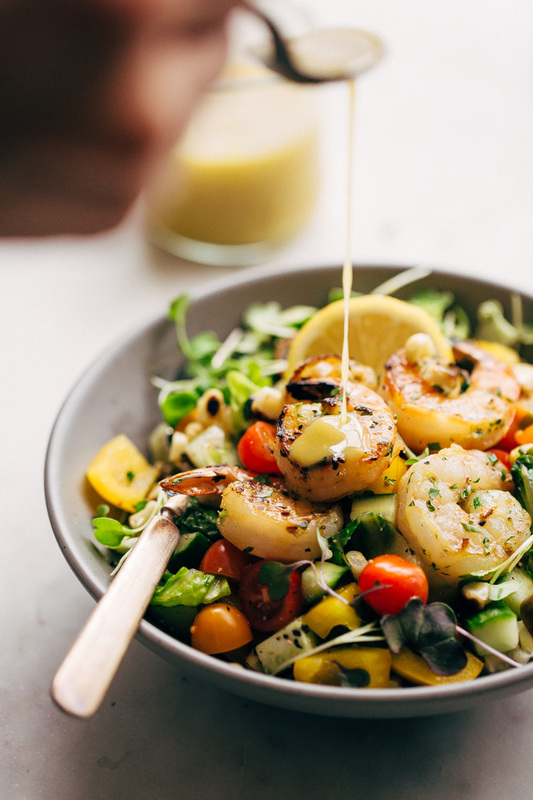 To finish off the salad – honey mustard vinaigrette. This dressing couldn’t be easier. We’ll combine a little honey, mustard, and white wine vinegar then just drizzle in the olive oil as we whisk and season with salt and pepper. It’s such a light and flavorful dressing and the honey mustard tastes great on grilled romaine. I’m using this vinaigrette on all my salads from now on. This goes out to all my friends that are bored sick of regular salads. Hey you! We have a lot in common. And I won’t judge, use chicken or shrimp or salmon kabobs (which I haven’t tried but would maybe, probably, might work?) So with summer just around the corner put this little number on the regular rotation, won’t you? 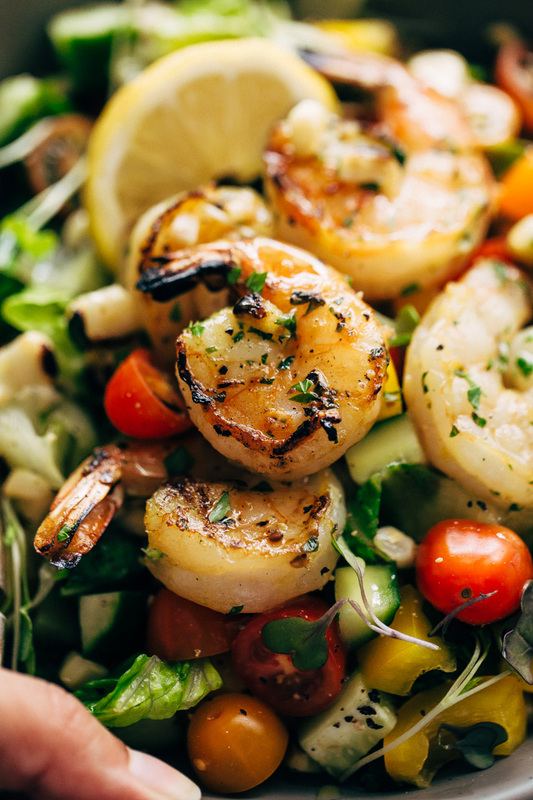 Forever a grilled shrimp salad lover out. 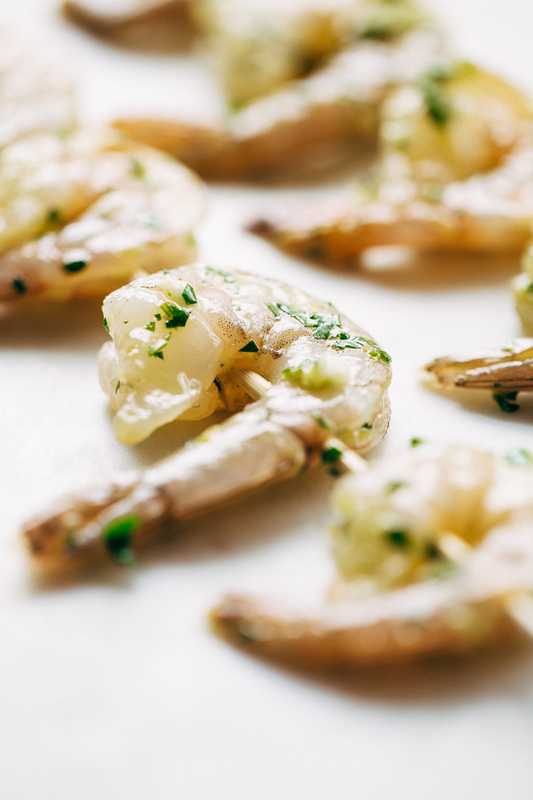 Shrimp: Add the parsley, garlic, lemon zest, olive oil and salt in a bowl. Add the shrimp and stir to combine. Let marinade for 10-15 minutes while you chop all the veggies and prepare the dressing. Place 4-6 shrimp on wooden skewers before grilling. Vinaigrette: Whisk together the mustard, vinegar, and 1 tablespoon of honey with a pinch of salt. Continue whisking as you stream in the olive oil. Taste and adjust with an additional tablespoon of honey if you prefer your dressing a little sweeter. Grilling: Preheat the grill and spray with cooking spray if desired. 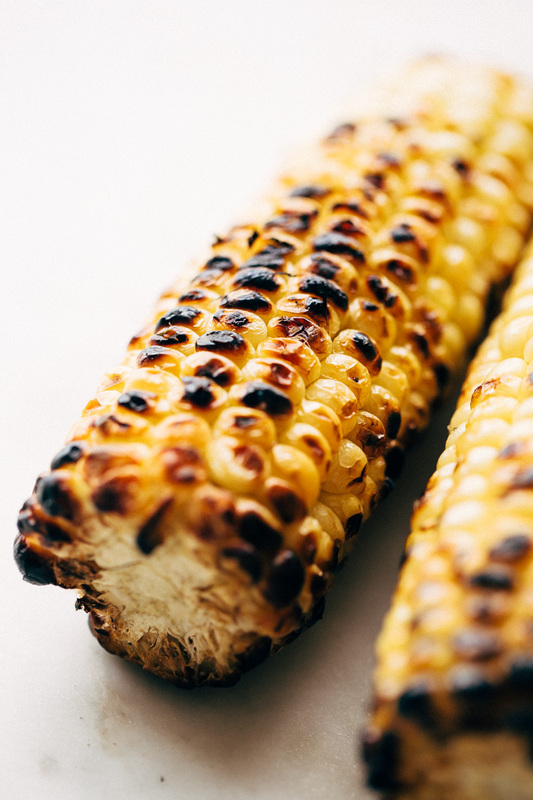 Grill time will vary for the ingredients so start with the corn. Spray the corn with cooking spray, season with a pinch of salt and roast, turning every 4-5 minutes for about 15-18 minutes total. Add the whole bell pepper next and grill for 1 minute or longer if you’d like it to char a bit. Add the shrimp skewers near the end of cooking time, they’ll take about 2-3 minutes per side. Spray the romaine hearts with cooking spray and sprinkle with a tiny pinch of salt, grill for about 2-3 minute on each side. 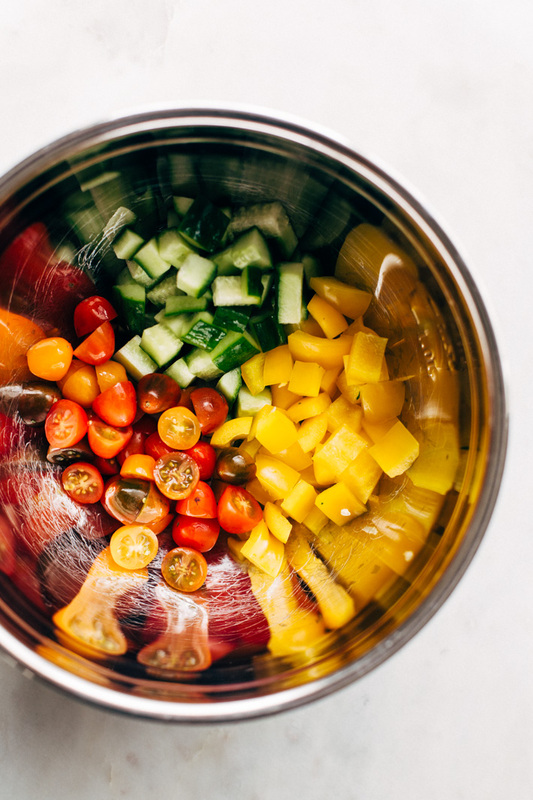 Assemble: Add the chopped cucumbers, avocados, and tomatoes to a large salad bowl. Remove the stem from the romaine hearts and chop. Chop the corn kernels off the cobb. Dice the bell pepper. Add all the ingredients to the bowl and toss with the dressing. Serve immediately. chicken will work well instead of shrimp for this recipe. You can simply grill the boneless chicken breasts or thighs and dice before adding to the salad. Note that the cooking time will be slightly longer for chicken breasts/thighs than shrimp. Though it’s not really part of the recipe, I added in a handful of pea shoots at the end just for pictures! 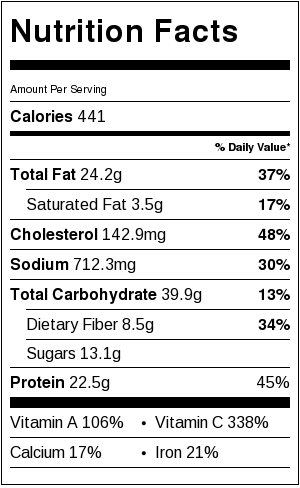 *Nutritional facts are for 1/4th of the recipe not including the avocado.